Argentina- the vast cone of territory reaching from Paraguay and Brazil down to the southern tip of Patagonia, has a wide variety of climates and soil types extremely well suited for the vine. Viticulture in Argentina dates to the very first cuttings brought by the Spanish in 1557. For centuries, most Argentine wine was produced for local consumption and the emphasis was on quantity over quality. Today, the country is gaining world recognition for the quality of its wines, particularly from Cabernet, Malbec and Bonarda and the pseudo-native variety Torrontes. 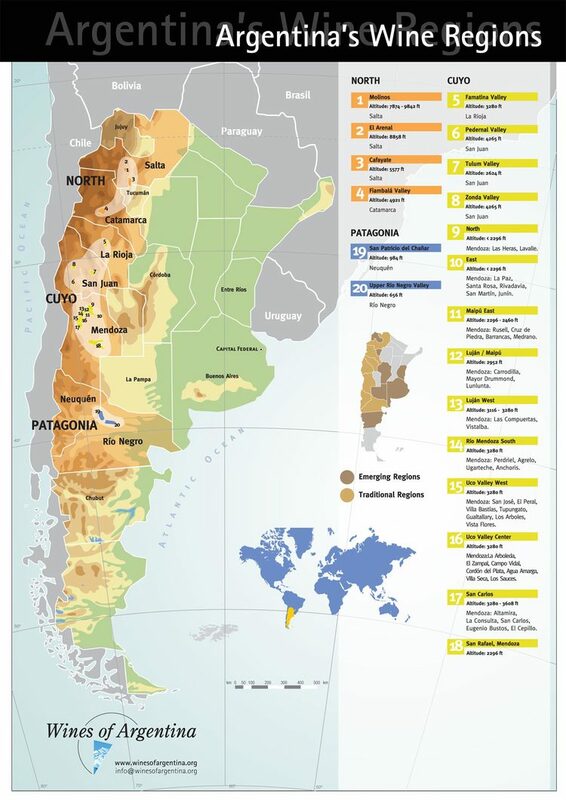 The main viticultural areas in Argentina are Mendoza, (the vast majority of Argentine wine), San Juan & La Rioja, all in the Cuyo region, then Salta and Catamarca to the far north and finally Patagonia to the south.